How to bisect an angle with compass and straightedge or ruler. To bisect an angle means that we divide the angle into two equal (congruent) parts without actually measuring the angle. This Euclidean construction works by creating two congruent triangles. See the proof below for more on this. This construction works by effectively building two congruent triangles. The image below is the final drawing above with the red lines added and points A,B,C labelled. 3 ∆QAC and ∆QBC are congruent Three sides congruent (sss). QC is common to both. 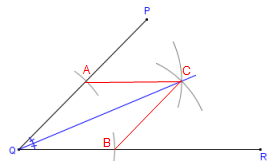 Click here for a printable worksheet containing three angle bisection problems. When you get to the page, use the browser print command to print as many as you wish. The printed output is not copyright.